This week's post is a collaboration with the lovely Nira from the blog 'ItsNira'. I don't know about you, but I absolutely love reading Q&A posts so me and Nira decided to put our own little spin on it. She has asked me 10 questions which I will answer in this post and I have also asked Nira 10 questions which she has answered in her post. My favourite subject is probably either Biology or Chemistry. I really can't choose between them, but I mean, you can tell I love science! I just love how there's always new things to learn and find out... even when you've left education and got a job! This is going to sound super cheesy, but I am SO SO SOOO proud of this blog and how far it has come. Everything from comments to awards to working with brands is appreciated more than you will ever know by me and Lucy! We were chatting not too long ago and said that if we were told when we first started the blog that we would be working with brands, we would never have started the blog because to be honest... it's quite scary at times... especially since we are only young! This is a big question and frankly speaking... I don't really know. I'm one of those people who just thinks that whatever is meant to happen will happen and I can only try to make my future what I want it to be. I would like to still be blogging and I would also like to have a degree and have a job working in a field related Biology or Chemistry. Timothy Goes to School all the way!!! Did anyone else watch that? It used to come on a TV channel called Tiny Pop. I'm not going to lie... I literally watched that show until I was like 12 years old and would probably still happily watch it now! If you have watched it, let me know who your favourite character was. Mine was always Yoko! Again... cheesy answer, but probably my parents! I don't think anyone could ever inspire me as much as my parents have since I've grown up with them. I am so thankful for everything they have done/are doing for me and I hope I can do that one day for my kids (if I ever have any)! I don't really have one to be honest, haha! Rapunzel for sure... it is partly down to me loving the movie Tangled though! I just love how she's a little naive, but can be funny and caring too and of course... I love her LONG hair! My favourite thing about this blog is the fact that I share it with Lucy. To be honest, there's no way I would have started a blog on my own. You might have thought that this blog only belonged to me since Lucy usually does all the behind the scenes work, but that's just as important so shouldn't go unnoticed! When we first started blogging, the blog belonged to me (Aleeha), Lucy and two of our best friends, Holly and Eleanor. Each of the letters in 'HALE' represent our names and since the blog was originally a blog by all four of us, it made sense to have that as our blog name. 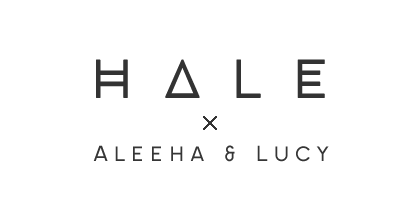 Now the blog is basically just by me and Lucy, but we've decided to keep the blog name as 'HALE' because we still like the meaning behind it. I think I would want to go back into the past. I would go back and see my parents' childhood and how they grew up. I think that would be really interesting. I remember that even when I was a child, touchscreen devices weren't a big thing so it would be really cool too see what my parents used to do to entertain themselves. Would you want to go back into the past or into the future?